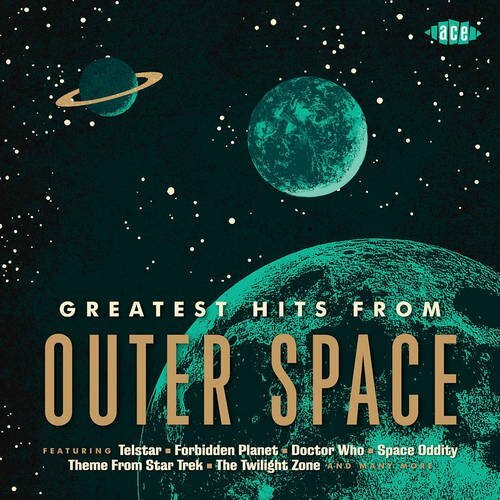 A concept so clever it's rather stunning it's never been used before, Ace's 2013 compilation Greatest Hits from Outer Space features 24 songs about the great starry sky. 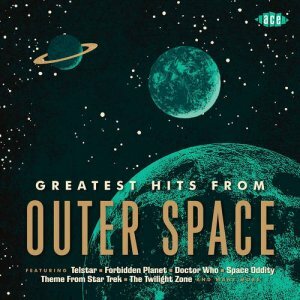 The bulk of these songs were cut between 1953 and 1970, a period that was the peak of pop culture Sci-Fi (the ringer is I-Roy's "Space Flight," from the late date of 1972), and there are certainly some shared images and sounds here. Flying saucers buzz by rockets to the moon, astronauts stare down little green men, Theremins vie with analog synthesizers on this spacious soundscape -- there are enough similarities to make this seem samey on paper, but this is hardly just dedicated to futuristic pop. Rockabilly wildman Billy Riley sings his frenzied ode to "Flying Saucers Rock & Roll," Lightnin' Hopkins salutes one of the first men in space with "Happy Blues for John Glenn," Moon Mullican lays down boogie woogie, and Vernon Green & the Medallions sing street corner harmonies about rocket ships, while the Ames Brothers cheerfully sing about the moon. As this suggests, part of the appeal of Greatest Hits from Outer Space is how it's not confined to any category: the disc flips between easy listening, soul, and rock & roll, spending as much time with Hollywood pizzaz as it does with backwoods fantasy. Some of the usual suspects are here -- it opens up with the theme from 2001; David Bowie's "Space Oddity," and the Byrds' "Mr. Spaceman" are both heard, as is the theme to Dr Who -- and sometimes there are fun spins on the familiar, as when Leonard Nimoy's "Theme from Star Trek" is substituted for the original, but the fun of this collection is hearing all the weird, buried rock & roll and soul that may not sound spacy but certainly are about the great unknown. It's a terrific pop cultural artifact.